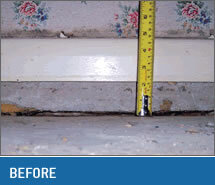 Floor slab settlement and sunken foundation problems in domestic housing can be traumatic for occupants, as conventional solutions usually involve having to find alternative accommodation, sometimes for weeks or even months. Uretek’s slab lifting and Deep Injection processes can treat the average domestic house in one working day, with no need to re-house occupants. “The reason that we go for Uretek is that tenants can just move to another room while the work is undertaken,” said Steve Davis, Principal Structural Engineer for Enfield Borough Council, for whom Uretek have carried out work on numerous properties, particularly on the Bullsmoor estate. Settlement and subsidence problems to the tens of thousands of porches and conservatories which been added on, often without adequate foundations, to existing structures can be a real headache. The disruption and cost of traditional remedial methods may not seem to justify the effort. “Piling seemed a bit of a drastic solution to this problem when disturbance and upheaval for the occupants was taken into account,” commented Mark Bilton of Hanover Housing Association, describing the settlement and partial detachment of seven porches in a development of single-storey linked properties belonging to the Association, built eight years ago in Horwich, Lancashire. Having considered the options, Hanover decided to use Uretek because resin injection has the advantage of minimal disruption – no excavations are needed, and there is little or no dust or mess. At Horwich, Uretek’s Deep Injection process was carried out over a period of five days and restored all seven porches to level. The occupants did not have to be relocated. At Redditch Borough Council, for whom Uretek have completed over thirty porch stabilisations, the prime concern was to not add more loading to poor ground. “It’s a matter of practicality,” commented the Council’s Ashley Stokes. “With more traditional systems you’re just adding more weight, and there was obviously a problem with the ground to start with. It was poor ground, and there was no provision of a proper foundation initially. The bank vault was out of level, which caused the door to close by itself. The 30 ton safe had subsided by 14mm on the left-hand side of the door opening, caused by badly compacted fill. The floor of the vault is constructed of 2 layers of 50mm steel plate with concrete infill, and this prevented drilling vertically through the floor. One wall of the safe is adjacent to an external wall of the building, and on the other side there is a passage between the external wall and the safe. The internal floor level is 800mm above external ground level. 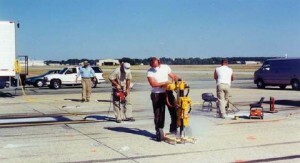 The drilling operation was executed horizontally from the exterior of the building. A number of pipes were inserted 600mm below floor level and directly below the concrete floor slab on the two sides, in varying lengths, reaching to the centre of the vault towards the subsided corner. The whole operation took 5 hours and the floor was successfully raised by 11mm achieving optimal lift for the door to function correctly. The work was executed during normal banking hours and did not cause any disruption to the daily functioning of the bank. Only one technician was located inside the bank vault monitoring the laser levels, while the injection process was executed from the exterior of the building. The Ramgoolam Building was built in the early 1930s in the city centre which was developed over an area characterized by underground mining operations. A leak in the municipal water mains was discovered over a two week period six months ago, soon after cracks started to develop in the façade of the building. The subsidence of the foundations caused the front door to the building to misalign making it a very difficult task to open. It has been recorded that 50 000 litres of water vanished under the building and found its way in the underground mine shafts. Uretek was required to stabilize the voids created by the water leak and strengthen the bearing capacity of the soil below the foundations. Uretek Deep Injection was applied to strengthen the foundations and stabilize the voids. 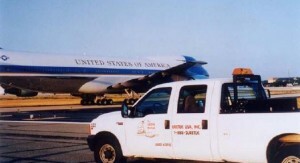 Andrews Air Force Base is the home to Air Force One, one of the most recognizable planes in the world. 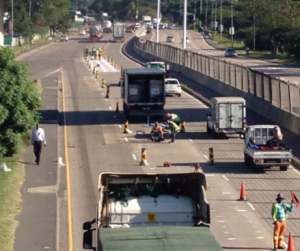 This can be a challenge however, when “ramp freezes” occur, shutting down operations due to security reasons. Every airport repair job needs to be completed quickly, but Andrews required even faster repair, repair only URETEK USA could provide. 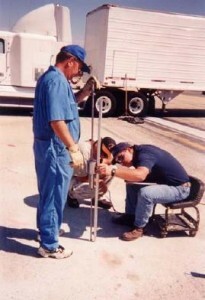 This unique process (The Uretek Deep Injection Process) relies on a two-part polymer system, injected beneath the concrete through pre-drilled holes of 5/8-inch diameter (penny-size). The polymerization between the soil and the slab yields a co-efficient of expansion of 20 to 1, and a lifting capacity of 8,000 pounds per square foot. The URETEK Deep Injection process was also used in this project to densify soils at depth by injecting the polymer below the soil-pavement interface. URETEK USA performed several tasks in a short time frame. First, they employed the URETEK Method to bring the panels in the dipped area to profile. 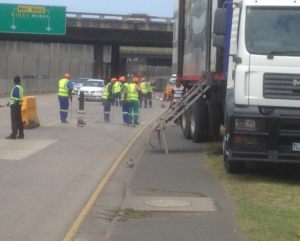 The crew then re-constituted the soils around the pipe with the Deep Injection process. Using a grid pattern, the polymer was injected at depth, working inwards towards the pipe to squeeze the water out of the soil and into the pipe. Sealing the leaky joints of the pipe was the next step before routing and sealing the pavement joints on the surface. To excavate and replace the area of concern would have cost approximately $250,000, with a crew on-site working 35 days. URETEK’s repair strategy cost half the replacement estimate, and took a total of 10 days to execute. Due to the interruption of the ramp freezes, crews worked mostly at night, keeping traffic rolling during peak hours. Pavement Lifting and Soil Stabilization. CONTROL. 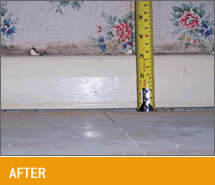 This is the before and after images of our services. The Uretek processes are economical, fast and convenient!